Sporty and versatile: The A4 Avant g-tron* is yet another Audi vehicle offering sustainable mobility for the future. Dealers will begin taking orders for the midsize model starting in early summer 2017. The A4 Avant g-tron is simultaneously sporty, efficient and extremely economical. The engine is based on the new 2.0 TFSI featuring an advanced, highly efficient combustion process developed by Audi. The turbocharged power plant produces 125 kW (170 hp). Maximum torque of 270 Nm (199.1 lb-ft) is available at approx. 1,650 rpm. The pistons and valves have been specially modified for gas operation and allow for an optimal compression ratio. An electronic controller reduces the high pressure of the compressed natural gas (CNG) flowing from the tank from as much as 200 bar to a working pressure of 5 to 10 bar in the engine. This pressure control function is performed dynamically and precisely in response to the power requested by the driver. The correct pressure is always present in the gas line and at the injector valves – low pressure for efficient driving in the lower speed range, and higher pressure for more power and torque. 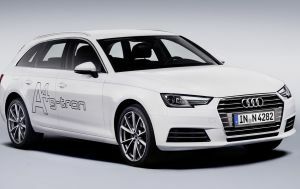 In the New European Driving Cycle (NEDC), the Audi A4 Avant g-tron with S tronic uses just 3.8 kilograms of CNG per 100 kilometers (8.4 lb per 62.1 mi) – that equates to fuel costs of only about four euros (as of: March 2017). CO2 emissions are about 100 grams per km (160.9 g/mi). comparable to that of a car with a TDI engine. Nor does driving enjoyment draw the short straw. In conjunction with the manual six-speed transmission, the A4 Avant g-tron accelerates from a standstill to 100 km/h (62.1 mph) in just 8.5 seconds. Its top speed is 223 km/h (138.6 mph). The filler necks for gas and gasoline are located under a common tank flap. After refueling, and whenever it is very cold, the engine is started with gasoline initially, then switched over to natural gas operation as quickly as possible. Two displays in the instrument cluster keep the driver up-to-date on the fill levels of the tanks. The driver information system shows the fuel consumption in the active operating mode. Audi installs the four cylindrical CNG tanks as a compact module in the rear end of the Avant. They are optimized for the available space, and each is specifically sized. Sheet steel shells with tensioning straps hold the cylinders and protect them against damage, such as curbs. The complete CNG tank module, which also includes the 25 liter (6.6 US gal) gasoline tank, is fitted during production of the A4 Avant. The spare wheel well has been eliminated. The battery also moves from the luggage compartment to the engine compartment. The loading floor is level with the loading lip, thus offering a full-fledged luggage compartment. The CNG tanks with an operating pressure of 200 bar at 15 degrees Celsius follow the Audi lightweight construction philosophy. Thanks to their innovative layout, they weigh 56 percent less than comparable steel cylinders. Their inner layer is a gas-tight matrix of polyamide. The second layer, a composite winding of carbon fiber-reinforced polymer (CFRP) and glass fiber-reinforced polymer (GFRP), provides for maximum strength. The third layer is pure GFRP and serves primarily as a visual inspection aid, turning milky white where damaged. Before being installed in a car, each tank is tested at 300 bar during production. The actual bursting pressure is much higher still and far exceeds the legal requirements. 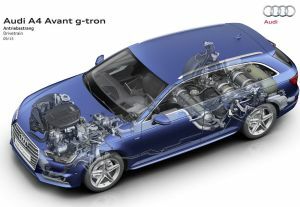 The A4 Avant g-tron is especially eco-friendly when running on Audi e-gas. This is the first virtually CO2-neutral long-distance mobility the company has offered. Audi and its partners produce the fuel using renewable energies, water and CO2 or from waste materials like straw and plant clippings. Among other things, the brand produces e-gas in its own power-to-gas plant in Werlte, located in Lower Saxony. The process: Three electrolyzers powered primarily by surplus green electricity split water into oxygen and hydrogen. 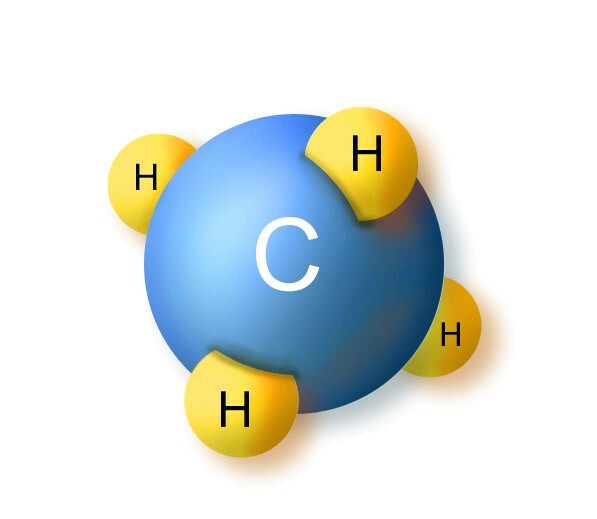 In the subsequent methanation process, the hydrogen reacts with CO₂. The result: synthetic methane – Audi e-gas – is created. This is fed into the European gas grid and compensates for the volume of natural gas used by the g-tron model in the New European Driving Cycle (NEDC). Customers can fill up their g-tron model at any CNG filling station and pay the regular price. By feeding the computed volume of Audi e-gas into the natural gas grid, Audi works behind the scenes to ensure the green benefits of the program, including the corresponding reduction in CO2 emissions. A fuel card is no longer used as the accounting tool. Instead, Audi computes the volume automatically based on surveys and service data from the cars. TÜV Süd, a German testing and certification corporation, monitors and certifies the process. Audi g-tron customers receive a document that confirms their car will be supplied with Audi e-gas and informs them about the certification.